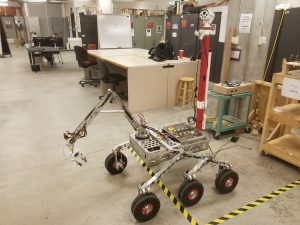 The MAVRIC Mechanical Team is responsible for the design, manufacture, and testing of all mechanical and electromechanical systems on the rover. This includes major subsystems such as the rover’s chassis, suspension, and robotic arm, as well as other considerations like camera mounting. The Mechanical Team also ensures the rover remains under the 50-kilogram mass limit imposed by URC. The main goal of Mechanical Team is to create a competition-suitable rover which will be mechanically sound through all of the competition tasks. 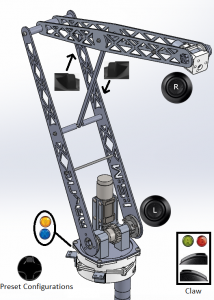 All designs are first developed in-house using SolidWorks, a Computer Aided Design software (Figure 1). This is a multistage process involving several gate reviews and design revisions. Once the design is finalized, manufacturing plans and other necessary files for production are developed. The rover (Figure 2) was largely manufactured using equipment on the Iowa State University campus. Manual mills, a 4-axis CNC mill, a waterjet, metal band saws, and various other machines were employed. 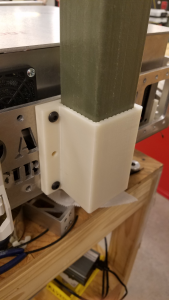 Various 3D printers located in the M:2:I Lab were used to create small, complex, durable, and lightweight parts around the rover. The manufacturing of the chassis was generously donated by Quality Manufacturing out of Urbandale, Iowa. The chassis was designed with numerous mounting holes on all sides for subsystem modularity. This provides for a greater amount of iterative improvement and minimizes operational downtime. 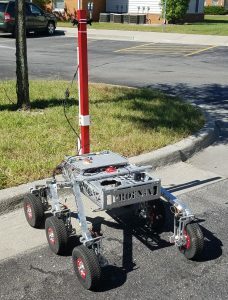 It allows the team to experiment with new subsystems without compromising rover functionality and permits backward compatibility, so new subsystems can be replaced with older ones if they fail or do not meet expectations. For example, if the rover suspension were entirely reworked, the current suspension could be removed and a new one attached within an hour without having to modify anything on the rover. The mast (Figure 3) and soil science system are also attached to the chassis by the side mounting holes. Mounting brackets inside of the chassis hold the electrical box in place and allow it to be easily removed for testing. A top plate over the front half of the chassis improves structural integrity and provides a mounting location for the robotic arm, light spectrometer, suspension differential bar, and power distribution box. 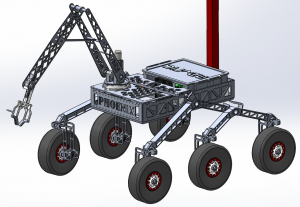 The rover makes use of a rocker-bogie suspension, which enables it to traverse large obstacles and helps keep the chassis stable over uneven terrain. The rocker has its range of motion partially limited to prevent failure in extreme terrain. The rover’s six wheels are individually driven by high-power in-hub motors, which provide enough torque to tackle steep inclines and maintain high ground clearance. High-traction 10.5″ wheels enable the rover to climb over large objects without issue. The rover utilizes skid-steering to maneuver on the desert sand; this results in significant weight savings by not requiring separate steering motors on the front and rear wheels. During outdoor drive testing in September 2018, the suspension performed very well on uneven and steep terrain (Figure 4). The rover’s robotic arm has five degrees of freedom. The base of the arm mounts to the top plate of the chassis and contains a motor to control the left-right swing of the arm. A second motor mounted on top of the arm base utilizes a worm drive to lift the arm at its shoulder. A linear actuator at the elbow provides more precise forearm movement. A dual-motor wrist joint offers both pitch and yaw at the end effector. The end effector is controlled by a single mini linear actuator and has the ability to manipulate a wide variety of objects up to five centimeters wide. The proposed controller mapping configuration (Figure 5) will allow the arm operator to intuitively control the entire arm from the base station.